The storm is forecast to reach Florida in a few days. As Florida residents prepare for Hurricane Irma, pet owners in the state will need to take extra precautions to help their animals. Aaron Johnson, director of the Montgomery County Animal Shelter in Conroe, Texas, was on the ground helping stranded animals to shelters after Hurricane Harvey struck the state last month. 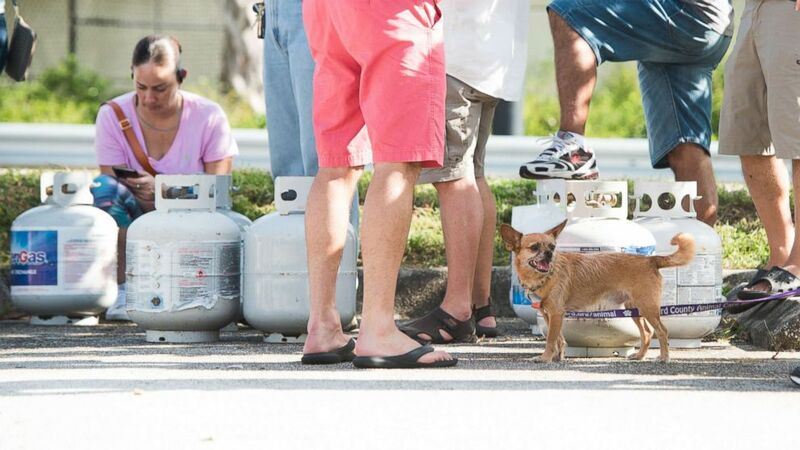 He advises Florida pet owners to be prepared and follow evacuation orders. "People just really need to have a plan," he said today on "Good Morning America." "Know where they’re going to evacuate if they need to evacuate, listen to authorities [and] do evacuate." Mandatory evacuations have already been ordered for Monroe County, which includes the Florida Keys, and parts of Broward County. Every Floridian should take storm preparations seriously and be aggressive to protect their family. (Orit Ben-Ezzer/ZUMA Press/Sp) Residents wait in line at a gas station in Fort Lauderdale, Fla., on Sept.6, 2017, as residents stock up in preparation for hurricane Irma. Johnson also advised pet owners to get their animals microchipped in advance and to make sure their pets' information is up to date if they are already chipped. That advice is echoed by the Humane Society of the U.S., which says in an emergency guide posted online to make sure at the very least cats and dogs are wearing collars or identification tags. The No. 1 instruction for pet owners in from the Florida Division of Emergency Management (FDEM) is to bring their pets with them when evacuating. FDEM also advises pet owners take steps before the storm strikes. For Florida residents, these precautions should be taken between now and Saturday, when Irma is expected to begin approaching the state. 1. Assemble a pet supplies kit: The FDEM advises creating a kit, stored in a sturdy container, with supplies for your pet including medications, leashes and/or carriers, current photos of your pet, food (including a can opener as needed), potable water and water bowls, toys and beds (if transportable), veterinarian contact information and a list of your pet's feeding schedule, medical conditions and any behavior problems. 2. Know exactly where and how to evacuate your pet: Some evacuation shelters will not accept pets so call ahead now to hotels and motels and family and friends outside of the storm zone to find out where your pet can seek shelter, FDEM advises. Local animal shelters and boarding facilities and veterinarians can also be resources for pet owners as they plan ahead. 3. Bring pets inside: As the storm approaches, bring pets indoors so you can evacuate or shelter inside at a moment's notice. As you evacuate, keep pets either on a leash or in a carrier at all times. "Don't leave animals unattended anywhere they can run off," according to the FDEM. The Humane Society tells pet owners to include their pets in the safe area of the home where they are sheltering too. The "safe room" in the house is where pets' emergency supplies should be stored as well, including food and water, medications and crates. For cats, make sure "unsafe nooks and crannies" in the home are sealed off so frightened cats do not have a place to hide. After Hurricane Harvey hit southeast Texas, stranded animals were pulled from flooded streets and taken to local shelters, while others rescued were flown to places as far away as California and the East Coast. Last week, around 100 dogs were airlifted from shelters throughout Texas to New Jersey to be placed for adoption. Pet owners who return to their home with their pets should make sure to keep their animals leashed as they readjust to their surroundings, according to the Humane Society. Pets may also be disoriented after being evacuated or enduring the hurricane, so pet owners are advised to be patient. "Try to get them back into their normal routines as soon as possible," the Humane Society advises, noting that pets with persisting behavioral or medical problems should be evaluated by a veterinarian.